From 21 June 2016, a duty surcharge applies to acquisitions of NSW residential land by foreign persons, including foreign individuals, corporations, trusts and governments. The surcharge does not apply to Australian citizens. The surcharge is payable in addition to any other duty payable on dutiable transactions. From 21 June 2016, the concession for residential off-the-plan purchases (which allows for an extension of up to 12 months in the payment of duty) is no longer available to foreign persons. Commencing from the 2017 land tax year, surcharge land tax applies to foreign persons who are owners within the meaning of section 3 of the Land Tax Management Act 1956 (the LTM Act), and subject to section 5A(4) of the Land Tax Act 1956. There is no tax-free threshold and no principal place of residence exemption for the surcharge land tax. Other exemptions specified in the LTM Act apply to the surcharge land tax. This Ruling explains the Chief Commissioner's interpretation of "foreign person" for both the surcharges duties and land tax purposes. provides that a New Zealand citizen who holds a special category visa, within the meaning of section 32 of the Migration Act 1958 of the Commonwealth, at any particular time is taken at that time to be an individual whose continued presence in Australia is not subject to any limitation as to time imposed by law. Note: an Australian citizen is not a foreign person under any circumstances - see paragraph 7; a New Zealand citizen may be a foreign person in certain circumstances - see paragraphs 8 & 9. Note: the meaning of "substantial interest" in a corporation or trust is explained at paragraphs 16 to 18. Note: the meaning of "aggregate substantial interest" in a corporation or trust is explained at paragraphs 19 to 20. Note: "general partners of limited partnerships" is explained at paragraph 15.
any other person prescribed by the FAT Regulation 2015. An Australian citizen, including a person who holds dual citizenships (one of which is an Australian citizenship), is not a foreign person under any circumstances, whether or not the person is ordinarily resident in Australia. Section 104J deems an Australian citizen to be ordinarily resident in Australia. A New Zealand citizen who, on the relevant date, holds a special category visa within the meaning of section 32 of the Migration Act 1958 of the Commonwealth, and has actually been in Australia during 200 or more days of the 12 month period preceding the relevant date, is not a foreign person. A New Zealand citizen who does not hold a special category visa and is not ordinarily resident in Australia as described at paragraph 10 is a foreign person. The meaning of "ordinarily resident in Australia"
the person is not in Australia, but, immediately before the person's most recent departure from Australia, the person's continued presence in Australia was not subject to any limitation as to time imposed by law. Individuals who are permitted to be in Australia under a visa that is not a permanent entry visa are "foreign persons", because the visas impose time limits on the person's lawful presence in Australia. Such visas include a work visa, a temporary entry visa, a visitor visa, a bridging visa and a business visa. lf a person is an unlawful non-citizen under section 14 of the Migration Act 1958, the individual's continued presence in Australia is subject to a limitation as to time imposed by law (see section 5(2) of the FAT Act). Such persons are therefore "foreign persons". A person who is entitled to reside in Australia under a permanent entry visa (i.e. a permanent resident) is not subject to a time limit and is only classified as a foreign person if the person does not meet the test of being ordinarily resident in Australia, namely, the part that requires that the person has actually been in Australia during 200 or more days of the preceding 12 month period (see paragraph 10(a)). A person who holds a Partner (Provisional) visa (subclass 309 or 820) will be treated in the same way as permanent resident visa holders. The 200 day requirement will need to be satisfied. A person who resides in Australia under a temporary visa is regarded as a "foreign person". The conditions applying to such visas means temporary residents are not regarded as being ordinarily resident in Australia, and their presence in Australia is restricted by time and/or may be terminated under the Migration Act. When does a person hold a substantial interest in a corporation or a trust? A person holds a substantial interest in a corporation if the person holds, alone or with one or more associates, an interest of at least 20 per cent in the corporation (see the definition of 'substantial interest' in section 4 of the FAT Act). A person holds a substantial interest in a trust (including a unit trust) if the person, with any one or more associates, holds a beneficial interest in at least 20 per cent of the income or property of the trust (see the definition of 'substantial interest' in section 4 of the FAT Act). A substantial interest may be held through interests in other corporations or trusts (see paragraph 24). Note: for the meaning of "associates" see section 6 of the FAT Act, and for the meaning of "interests" see sections 4, 11 & 17 of the FAT Act. Persons A, B and C own 20%, 10% and 70% of the shares respectively in Company X Pty Limited which is registered in NSW. A & B are associates and together hold 30%. C owns 70%. Each shareholder has a substantial interest. Two or more associated persons hold an aggregate substantial interest in a corporation if the persons, alone or with one or more associates, hold an aggregate interest of at least 40 per cent in the corporation. Two or more persons hold an aggregate substantial interest in a trust (including a unit trust) if the persons, with any one or more associates of any of them hold, in the aggregate, beneficial interests in at least 40 per cent of the income or property of the trust (see the definition of 'aggregate substantial interest' in section 4 of the FAT Act). Note: individual interests of less than 5% in a listed corporation or trust are disregarded in certain circumstances - see paragraph 25. Company Y Pty Ltd has 2000 shares issued and persons A, B, C & D hold 200 shares each. Persons A, B, C, & D hold 800 out of 2,000 issued shares (40%) and therefore hold an aggregate Substantial interest. the percentage of the issued securities in the entity that the person, with associates, would hold at the relevant time assuming that any future rights they hold to securities in the entity were exercised (unless it can be determined at that time, from the right itself or from the circumstances existing at that time, that the right will not be exercised). Mr and Mrs Green (associates) hold 15% and 5% of the shares, respectively, in Company Z.
Mr and Mrs Green therefore both hold an interest of 20% in Company Z. For a discretionary trust, each beneficiary that the trustee has discretion to distribute the income or property to is deemed to have the maximum percentage interest in the income or property that the trustee may exercise a discretion to distribute to them. This includes all beneficiaries of the discretionary trust, not only beneficiaries who are takers in default. The beneficiaries also do not need to be specifically named by the discretionary trust. If any beneficiary is a foreign person, the trustee of the trust will be deemed to be a foreign person. XYZ Discretionary Trust is established with A (an Australian citizen) as the primary beneficiary (taker in default) of the trust and all of A's family members and their partners are potential beneficiaries. In addition to these beneficiaries, any company or trust that the beneficiaries have an interest in are also potential beneficiaries. A has one share in ABC Pty Ltd. However, B, another shareholder of ABC Pty Ltd, who is a person not ordinarily resident in Australia, holds a substantial interest in the company. The trustee of XYZ Discretionary Trust is therefore a foreign person. ABC Discretionary Trust is established with C (an Australian citizen) as the primary beneficiary (taker in default) of the trust and all of C's family members and their partners are potential beneficiaries. In addition to these beneficiaries, any company or trust that the beneficiaries have an interest in are also potential beneficiaries. C has one share in XYZ Pty Ltd. However, D, another shareholder of XYZ Pty Ltd, who is a person not ordinarily resident in Australia, holds a substantial interest in the company. ABC Discretionary Trust contains a clause to exclude any foreign person as defined under the Duties Act 1997 and Land Tax Act 1956 from benefitting from the trust. ABC Discretionary Trust is therefore not a foreign person for the purposes of the Duties Act 1997 and the Land Tax Act 1956. A substantial interest or an aggregate substantial interest may exist as a result of holding interests in other corporations or trusts under the tracing provisions in the FAT Act (see section19 of that Act). The tracing process can be applied multiple times through a number of entities. As foreign person X has a substantial interest in Company A, Company A is a foreign person. As Company A has a substantial interest in trust B, foreign person X is deemed to hold the 20% interest in Trust B, making Trust B (the trustee of Trust B) a foreign person. 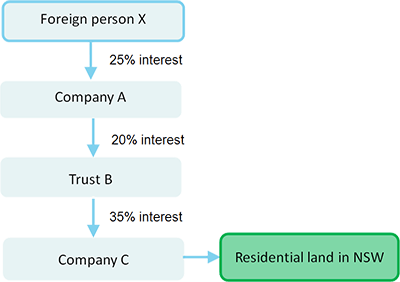 In turn, Trust B has a substantial interest in Company C, making Company C a foreign person, as foreign person X is taken to hold the 35% interest in Company C.
Corporations and trusts are "foreign persons" if an aggregate substantial interest is held by two or more "foreign persons" (and their associates). However small holdings of less than 5% are not counted towards an aggregate substantial interest if the corporation or trust has its primary listing on a stock exchange in Australia (see section 47 of the FAT Regulation). ^ Evidence of Australian citizenship includes a birth certificate (with limits after 1986), an Australian passport or an Australian citizenship certificate (together with a change of name certificate if the name is different). ^ If the trustee itself is a foreign person but none of the beneficiaries of the trust are foreign persons, then the trustees is not a foreign trustee and will not be liable for surcharge purchaser duty. A trustee will only be liable to surcharge land tax if it is a foreign person, because of its capacity as a trustee of the trust and not because the trustee itself is otherwise a foreign person. ^ Includes, among other things, shares in a company and units in a unit trust.